As a small business in Melbourne we know it is all about getting stuff done. Given the endless choices out there for small businesses, we know you might need some help along the way to make the right marketing decisions. We work with you like a marketing coach providing marketing consulting services to ensure that you don't get trapped in the marketing tactics that waste your time and money. Every new client becomes a part of our Marketing Knowledge Portal that assists you make better marketing decisions with its wealth of resources. However we know that some of you will just want to outsource the whole function of marketing and do what you do best. The way people seek information has changed. Customers no longer wait for a sales person to call to get information about a product that may help them do their work better. In fact, they may no longer even visit your company website as the first stop in their buyer search. They look to social media and content sharing for information to frame their decisions. 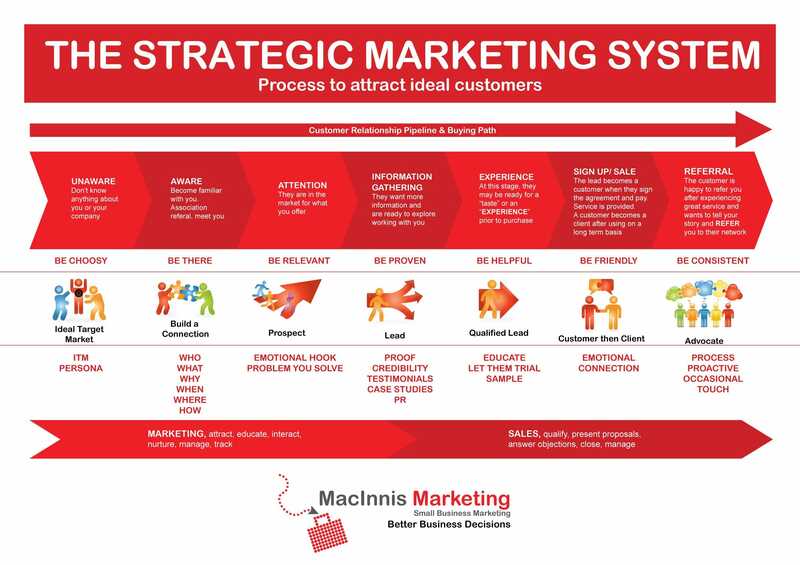 We use the Strategic Marketing System to build communications with customers in the way they want to engage. We map out their journey with you and ensure that it is delivering the sort of information, education, support and advice that has them coming back to get the best information to the problem you solve for them. We call this customer centric marketing. We plan out each touch point with your customers to ensure they move through their journey with you to be life-long customers and if they opt out, then they probably were'nt a great match for the services and the products you offer. Marketing in action are marketing activities that align to the customer journey. Pushing and interrupting customers no longer works. Customers are actively seeking information to assist them to make better decisions. Our role is to make this easy with your business. Ready to start?